If there is one thing i get complimented on every single day it is my hair. With so many different types of hair products on the market, it can be so confusing knowing exactly what you need and how they work. As someone with super long (hip length) thick, dehydrated and naturally blonde hair, i know i need something that is healthy for my scalp, has hydrating and detangling properties and can give shine. 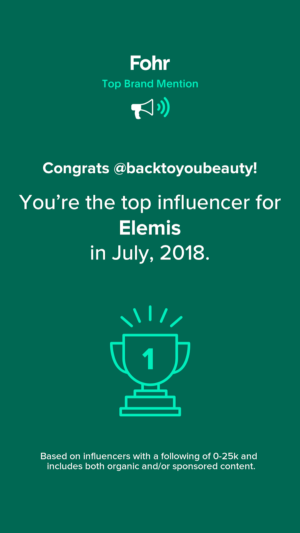 I know that we all have such different hair needs just as we do with skincare, but i wanted to share three hair brands that i think will work really well for many people. Long time readers of my blog will be aware of my love for SBC gels. My family use their Arnica gel and Propolis gels and shower gels constantly so i knew these would be great additions to the range. If you know my story regarding hair products, you will know that years ago i had an awful scalp due to medication. It was very dehydrated, constantly itchy and painful and was so bad i had to use steroid lotion daily. The bad thing about that was it actually caused bald patches on the front of my hairline that are irreversible. I would often slather my head in sudo-cream and SBC propolis gel just to find some comfort. 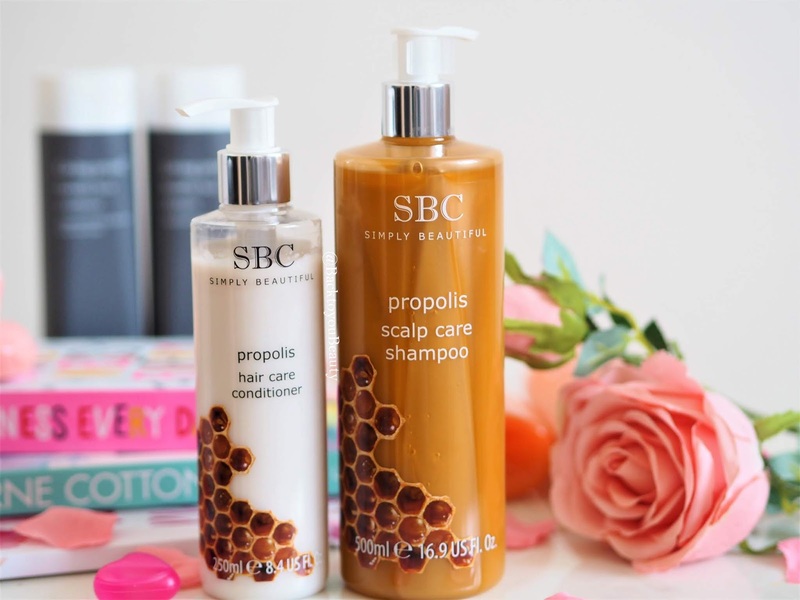 Now i am thrilled that they have a propolis based shampoo and conditioner collection. For those that don’t know, Propolis is rich in antio-oxidants and bio-flavonoids and is an amazing mixture of sap picked up from plants and botanical sources that Honey Bees collect to seal and protect their hives. SBC have managed to combine this beautiful, special and very expensive product into a gorgeous hair care collection. With the aim to soothe dry, itchy, sore scalps whilst also protecting the hair follicle and gently deep cleaning and hydrating the hair, i think this works well….however! As someone with incredibly long hair, i have discovered that it does leave my hair quite tangled even when i use it with the accompanying conditioner. It does smell absolutely incredible, it has a hint of creamy honey to the scent, is an incredibly silky and luxurious shampoo and is SLS free so for all those reasons i love it, but it does leave my long hair quite tangled. I think for me, having used it quite a lot of times and enjoying how it leaves me scalp feeling hydrated and non itchy, it is better for me to apply this to my scalp where obviously it is needed and then apply a more detangling shampoo to the length of my hair. The Propolis hair care conditioner also comes in a fabulously handy pump bottle which works perfectly in the shower and also has the most amazingly, mouth-watering scent that does really last on the hair. Containing Honey, Royal Jelly and Pro-Vitamin B5 this conditioner feels incredibly silky and luxurious. When used in conjunction with the above shampoo, my hair was left looking very shiny, which is hard on blonde hair, but, again, my hair was quite tangled and took a lot of combing through. I think if you have shorter hair than me you will love these products as they feel so beautiful on the scalp and leave it feeling soothed and hydrated. 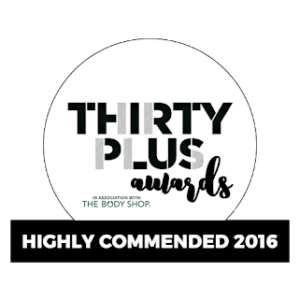 Right now you can purchase the 2 x shampoo for £30.00 and get a free conditioner HERE. Living proof is the high end, luxurious, multi award winning, loved-by-celebrities everywhere, haircare brand that uses science and patented technology, to create hair care products for every kind of hair type and condition. 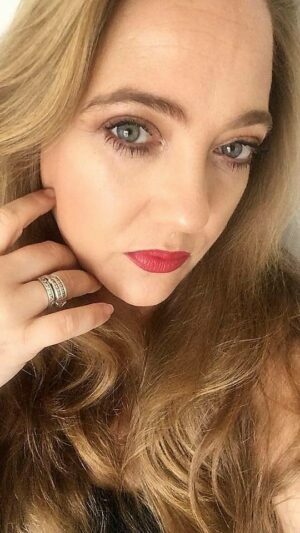 The healthy hair range is perfect for anyone struggling with hair issues such as, dullness, flat, lacking gloss, maybe a little frizzy and needs some life and love put back into it. Healthy Hair is exactly what you will get when using this range and what i love is that is cleanses my hair so deeply that it actually allows me to go much longer between hair washes which is fabulous! Powered by Living Proofs patented healthy hair molecule OFPMA – it creates a thin, weightless, invisible protective shield around each hair strand. If you have long hair or are growing you hair, then this is an absolute must. No ifs, no buts, no coconuts. 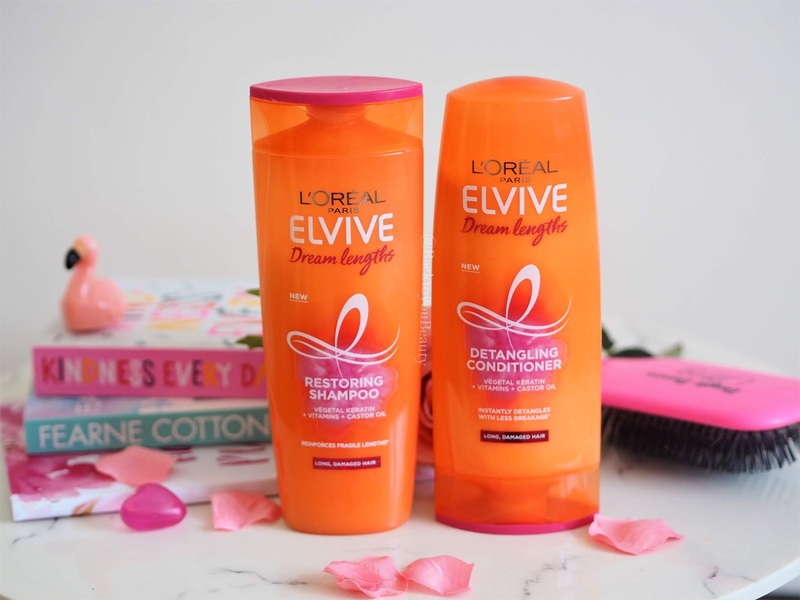 L’Oréal Elvive Dream Lengths Shampoo is my current favourite day to day shampoo. It smells absolutely incredible, almost fruity in a Caribbean cocktail kind-of-way. The shampoo is incredibly silky and only a small amount is needed. It lathers beautifully and literally coats all of my hair from roots right down to the tips. Containing Keratin, Vitamins and Castor oil, this formula enriches and almost strengthens the hair against breakage and split ends, plus it makes my blonde hair appear blonder and brings out all the colours, leaving it incredibly shiny. I am totally addicted to this shampoo right now and love how soft my hair feels after washing. Pair this with the matching L’Oréal Elvive Dream Lengths Conditioner and you are winning. If you do have long hair, it can be a real arm ache brushing and drying you hair after washing. I know for me it can take at least half an hour just to detangle my hair from washing. Using this Dream Lengths Conditioner has been an absolute revelation for me. It is the best detangling conditioner i have ever used and believe you me, i have stayed very loyal to hair brands over the years and this has won hands down. Again it has that deliciously fruity scent, is enriched with Keratin, Vitamins and Castor oil and can reduce breakages caused by brushing by up to 50%. My hair has never looked better than when i use these two products and that is a fact. What type of hair do you have and what are your go to hair care products? I would love to know as i am obsessed with great hair care. Please let me know by leaving me a comment below. 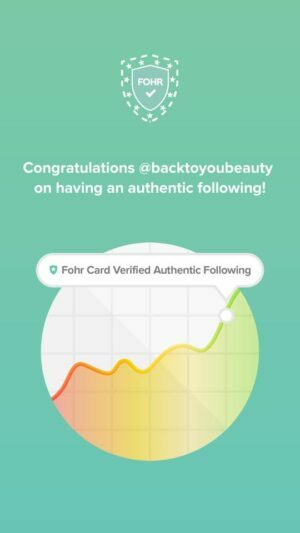 "Tried & Tested : Freshly Cosmetics Launches in the UK"
"Fancy a gradual tan that helps you build a real tan? 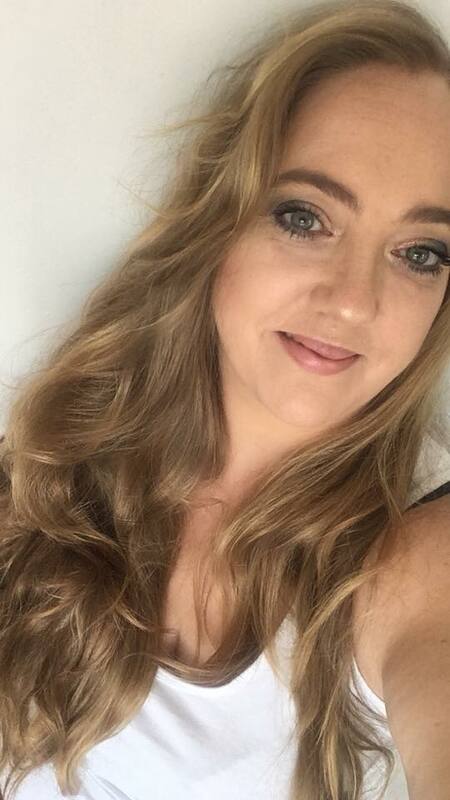 Check out Utan & Tone and their upcoming QvcUK Tsv"
I really want to try more from Living Proof although I tend to buy colour preserving hair care products. 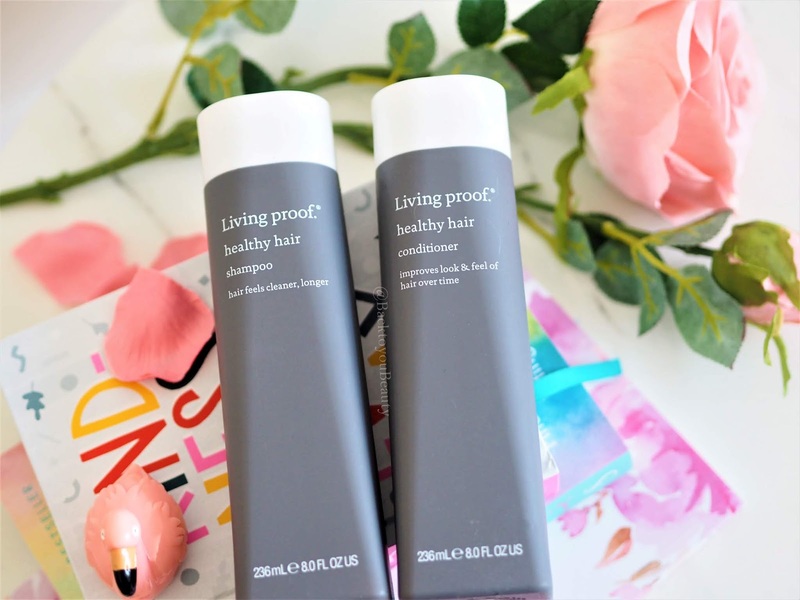 I love Living Proof, they make such great hair products!